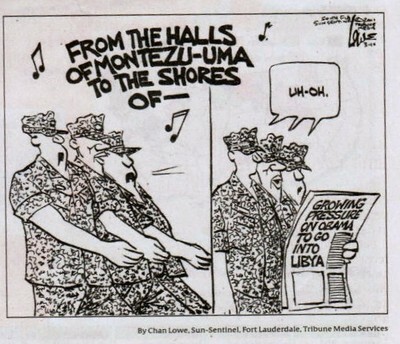 The official hymn of the U.S. Marine Corps famously begins with "From the Halls of Montezuma to the shores of Tripoli, we fight our country's battles on the land as on the sea." 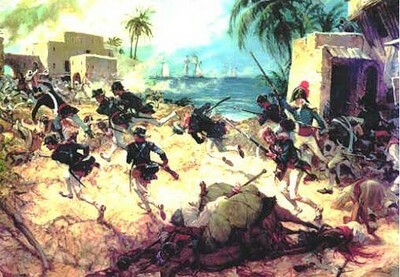 The reference to Tripoli alludes to the Battle of Derna of 1805, the first overseas land combat fought by U.S. troops and a decisive American victory. A U.S. Marine painter, Charles H. Waterhouse, depicts "The Assault on Derna, Tripoli, 27 April 1805." Recent fighting in Libya prompts a question: Should the marines be sent anew to the shores of Tripoli, this time to protect not the high seas but the rebellious peoples of Libya rising against their government and calling for assistance as they are strafed from the air by troops loyal to Mu'ammar al-Qaddafi? My first instinct is readily to agree to a no-fly zone, thereby improving the odds for the valiant opposition. Several factors encourage this instinct: Libya's easy accessibility from U.S. and NATO air bases, the country's flat and sparse geography, the near-universal condemnation of Qaddafi's actions, the urgency fully to restore Libyan oil to the export market, and the likelihood that such intervention will end the wretched 42-year rule of an outlandish and repulsive figure. But instinct does not make for sound policy. An act of war requires context, guidelines, and consistency. However easy the operation might look, Qaddafi could have unexpected reserves of power that could lead to a long and messy engagement. If he survives, he could become all the more virulent. However repulsive he may be, his (Islamist?) opponents could be yet more threatening to U.S. interests. More broadly, meddling in an internal conflict could make more enemies than friends, plus it would fuel anti-American conspiracy theories. U.S. Secretary of Defense Robert Gates, surrounded by brass, explains to Congress why he shies away from military engagement in Libya. Further, airpower has not yet proven decisive in Libya (its impact has been mainly psychological) and might not determine whether Qaddafi manages to stay in power. Imposing a no-fly zone in Libya sets a precedent in situations where circumstances are less favorable (e.g., North Korea). And who will follow Qaddafi's example and give up making nuclear weapons if this eases his own loss of power? Behind the Libya debate looms the specter of Iraq and George W. Bush's "freedom agenda." Bush's partisans see this as pay-back time while skeptics worry about unintended consequences. Were Barack Obama to use force in Libya, it would be tantamount to his conceding he was wrong to savage Bush's Middle East policies. It would also, following Iraq and Afghanistan, involve American troops fighting the forces of yet another majority-Muslim country, something that Obama, with his emphasis on "mutual respect" with Muslims, must be loathe to undertake. More fundamental is the imperative not to put American troops in harm's way on behalf of humanitarian goals for other peoples; social work cannot be the U.S. government purpose; rather, troops must always forward specific American national interests. 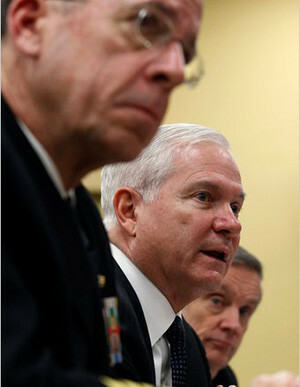 That the U.S. military, as personified by Secretary of Defense Robert Gates, shies away from taking on this duty, emphasizing its costs and dangers ("a big operation in a big country"), serves as a salutary caution, especially given lapses in U.S. intelligence. That Libyans are starting to turn to Islamists for leadership, however, could turn Libya into another Somalia. The American arsenal permits a president to ignore other states and deploy unilaterally; but is this wise? Iraqi precedents (1991, 2003) suggest it is politically worth the inconvenience to win endorsement from international organizations such as the United Nations, the North Atlantic Treaty Organization, the Arab League, the African Union, or even the Organization of the Islamic Conference. 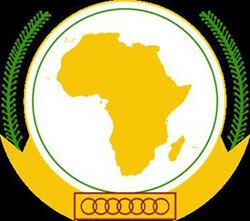 Would endorsement by the African Union (logo above) make a difference? As Jeffrey White of the Washington Institute for Near East Policy notes, although a no-fly zone is what the opposition requests, it is just one of many options available to Washington. Others include, from least to most ambitious: providing opposition forces with intelligence, logistical support, communications hardware, and training, sending them weapons; helping defend liberated areas; rendering Libyan airfields inoperable; or actively fighting regime forces. Taking these considerations into account, what advice to give the Obama administration? Help the Libyan opposition with aid and escalate as needed. Humanitarian, political, and economic reasons converge in Libya to overcome legitimate hesitations. Working with international authorization, the U.S. government should fulfill its accustomed role of leadership and help Libya's opposition. However risky that course, doing nothing is yet riskier. Mr. Pipes, director of the Middle East Forum and Taube distinguished visiting fellow at the Hoover Institution, taught strategy and policy at U.S. Naval War College. By secretly equipping and training anti-government forces, regime change can be accelerated without Western troops actually being deployed on the ground. ... Training is critical for military success. Western intelligence services could covertly arrange for the rapid training of key people outside of Libya, possibly in third countries, who will then return to Libya and train others. Related Topics: Libya, US policy | Daniel Pipes receive the latest by email: subscribe to the free mef mailing list This text may be reposted or forwarded so long as it is presented as an integral whole with complete and accurate information provided about its author, date, place of publication, and original URL.